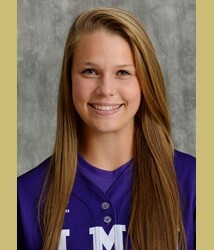 James Madison softball freshman Megan Good was recognized by the conference for the fifth time this season as she was named Colonial Athletic Association Pitcher of the Week on Monday. Good went 4-0 in the circle to help the Dukes win a pair of games at North Carolina and sweep the three-game CAA series against the College of Charleston. In 22.1 innings of work, she had a 1.57 ERA after allowing seven runs (five earned) and 19 hits while walking just three batters. She also struck out 19 batters while holding UNC and CofC to a combined .224 batting average. In Wednesday’s second win at UNC, Good had a no-hitter through five innings, giving up just one hit in the sixth inning in her first triumph of the week. She was credited with all three winning decisions in the Dukes’ sweep of the Cougars after conceding just two earned runs and 11 hits in 14.1 innings. She also hit well, going 7-for-18 (.389) with three RBI’s and a run. In JMU’s 6-0 start to CAA play, Good has earned five victories. Her 16-0 season record is the best start to a season of any JMU player in program history, as no other pitcher has ever won more than their first five games in the circle to start the year. This is the second time Good has been awarded the league’s top pitching honor and the eighth CAA laurel by a JMU player this season. Joining Good on the awards list this week were Elon’s Kara Shutt, who was named CAA Player of the Week, and Hofstra’s Brielle Pietrafesa, the Rookie of the Week. The 25th-ranked Dukes have now won a program-record 18 straight games and will take its 27-6 record (6-0 CAA) to Hempstead, N.Y., where it takes on rival Hofstra (15-7-1, 6-0 CAA) on April 3 and 4. Friday’s doubleheader will begin at 2 p.m. and Saturday’s finale is set for a noon start.